The singer and actor Peter Klaptin grew up dreaming of being both a superhero and a rock star. After becoming an incredibly successful musician, he decided to focus his energy in the pursuit of his seemingly unattainable goal and designed a costume. The celebrity went out on a single mission but was defeated by the supervillain Basher with ease. Depressed with his failure, Klaptin walked the dangerous streets of downtown Chicago alone and was attacked by a gang of young toughs. His life was saved by the timely arrival of Chris Robinson, using his marine-trained fighting skills to save Klaptin. The singer offered the young man a job as both his bodyguard and the costumed hero of Star. If he could not actually be a hero, he would make the world think he was by disappearing every time Star is in action. This business relationship continued very well for a few years until the Vicious Circle decided to uncover Star’s true identity so that they could prevent him from interfering with their activities. Peter Klaptin was taken to a hidden warehouse and suffered an horrendous beating, the criminals believing he was the vigilante. He is only saved by the real Star, revealed to be the bodyguard of the celebrity, Chris Robinson. The singer fired his employee after he is rescued. Peter Klaptin attempted to claim glory by placing his well-trained limousine driver as the third Star and installed him as the leader of Freak Force, becoming the team’s financial benefactor. This new Star was killed by Dr. Nirvana during a battle between Freak Force and the Frightening Force. 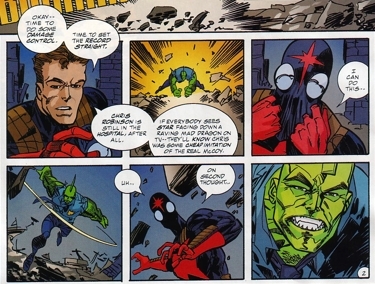 In the reality that Dragon found himself in after his clash with Damien DarkLord, the partnership between Peter Klaptin and Chris Robinson ended a lot sooner than in the previous universe. Star had his race revealed when he was badly injured during the breakout at Stronghold Penitentiary due to Mighty Man II not making his presence known. Peter fired his bodyguard and opted to return to the costume himself.